The Mac App is a great way to use IDoneThis. It directly mirrors what you're using via the Web Browser, but at the comfort of having it installed on your Mac. 1. Download the Mac App here. 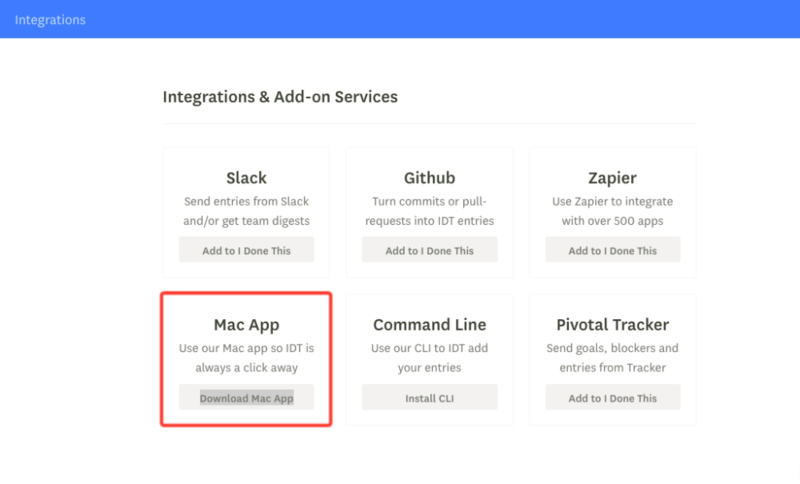 Alternatively, you can find the I Done This Mac App in the integrations page. 2. After downloading the .zip file, expand the .zip file that will install the I Done This Mac App. Afterwards, you'll be able to find it within the Downloads folder (or where ever you store your unzipped files). 3. Open the app and log in with your credentials, and you'll now have access to I Done This through a Mac App! I've clicked on a link and can't access I Done This through the Mac App. Please help! To go back to a previous page within the mac app, simply press Alt + Left on the keyboard. That will send you back to the previous page. Alternatively, Alt + Right will move you to the next page you have previously entered.